I remember back in the 6th grade how I begged my mom to buy me some clogs from the mall. All the girls at school had a pair. I even bought some at the thrift store, but they were too big so I never wore them. Then circa 1997, I was in the 10th grade, and Candie's were all the rage. Remember those? I think they came out in the 70s. When I was in high school, they were making a come back. Like they had in the 80s, too, I think. But mine were not as cool as the ones pictured below. Mine were all chunky clog-like with thick straps, but I loved them. 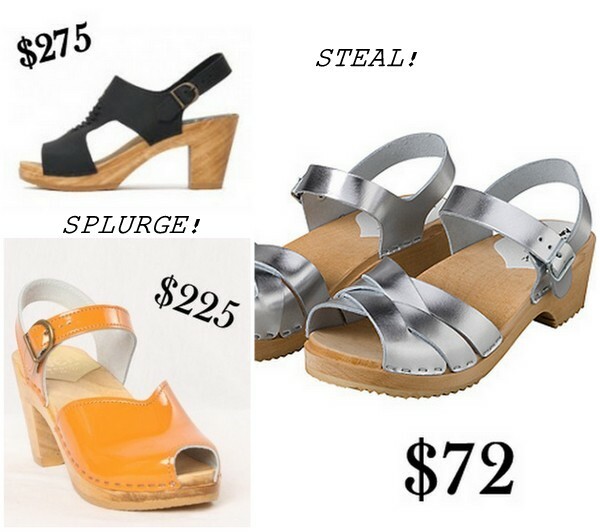 Fast forward to 2013, and I am still obsessed with clogs. Last year I bought myself a red pair of Swedish Hasbeens. So comfy! There are other yummy brands, too. Yours look a lot like a cute pair from Madewell I had my eye on last year! If I didn't have a bad ankle, I would be so all over the super high ones!